The Houston Museum of Natural Science has been a member of the Houston Community since 1909. We were established by the Houston Scientific Society, whose members had names like Ideson, Attwater, Westeimer and Kirby. We have so many ties to Houston history that it seems every time the wrecking ball swings we lose a part of our own past. With that in mind, I’ve decided to call up the ghosts of Houston’s past so we can at least preserve the memory of some of Houston’s lost history. There’s honestly so much to cover that this is going to be a series of blogs. 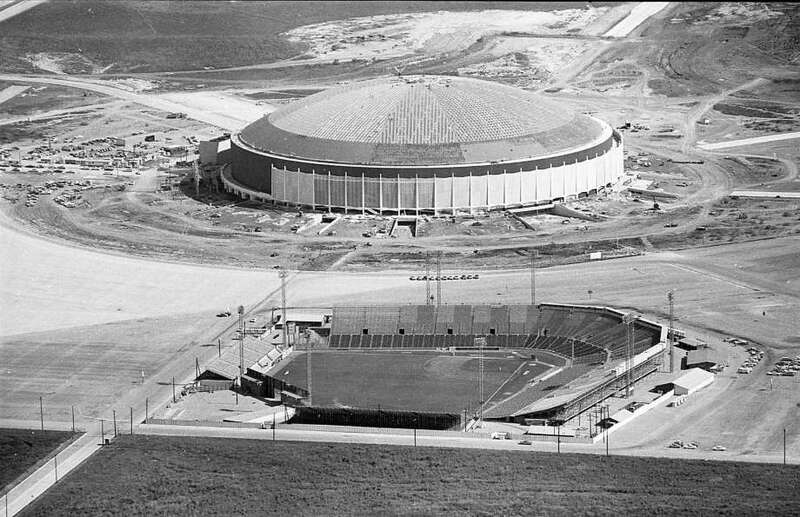 Today we are staring with a chapter of Houston’s history that I only just now discovered: Houston’s lost stadiums. Interestingly, both of the stadiums that will be discussed in this blog are examples of Houston history that died hard. Neither structure went quietly into the night, and you can find traces of both today if you look hard enough. Before the Astros were the Astros they were the Colt .45’s. In 1962, when MLB’s National League expanded its franchise into Houston and New York, Houston’s new team was dubbed the Colt .45’s. The team kept this name for only three seasons before re-branding themselves as the Astros. Some fans still remember the Colt .45’s fondly, and there are numerous collectors snatching up memorabilia of the team on ebay, but one thing about the team that nobody remembers fondly was their original stadium. When the team was first formed the Astrodome was still just a twinkle in team owner Judge Roy Hofheinz’s eye. So a temporary wooden stadium was constructed for the team to play in until the massive building project could be completed. Although it was a temporary structure, the stadium was pretty massive, able to seat 30,000 spectators. The problem wasn’t size, it was comfort. The stadium was a single-deck, one tier platform with no sort of roof at all. That meant there was no shade for no-body, even the expensive seats close to the field didn’t have an upper deck of seating to shade them. Imagine thousands of sweaty bodies baking in the oppressive Houston heat and humidity, crammed in close together and you have a day at the ballpark in 1962 Houston. Sunscreen and mosquito spray were sold at the concession stand, but they were not enough to significantly lessen the ordeal. During a doubleheader in 1962, 80 people reportedly suffered heat exhaustion. The Colts played their last game in the stadium on September 7, 1964. Next season they played in a new stadium under a new name. But that wasn’t then end of Colt Stadium. The structure sat abandoned for years, eventually being dismantled and left to rot. But then in the mid-70’s the structure was sold to a Mexican Minor League team called the Torrean Cotton Pickers. The structure was shipped away and reassembled in it’s new home in Mexico. The field got the nickname “El Mecanico” (Spanish for erector set) because it was taken apart and put together like the kid’s toy. After six seasons in Terreon, the stadium was bought by the Stevedores of Tampico and moved once again. In the mid 80’s the Stevedores relocated and left Tampico, and El Macanico, in the dust. The Mexico City Tigers disassembled the structure and considered moving it to Mexico City to be their new home, but by then the structure had been compromised by Tampico’s tropical climate and it was decided that the old stadium should be retired, A section of the stadium was donated to the Factory Workers League of Tampico where was in use a late as 2000. 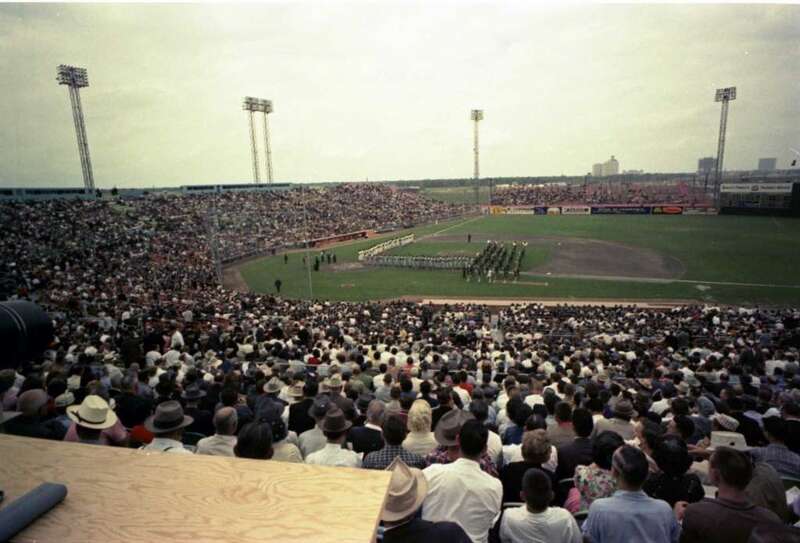 1962 Houston Colt 45s opening day ceremonies. The Houston Colt .45s made their National League franchise debut April 10, 1962 with an 11-2 victory over the Chicago Cubs before 25,271 at Colt Stadium. Source: Houston Chronicle. Colt Stadium is the only Major League stadium to be sent down to the Minor League and it’s also the only stadium ever to host three different teams in two countries. It’s a little ironic: An old structure that has been long forgotten in Houston has been preserved in Mexico. A structure that every Houstonian was happy to see go has gone on to win the hearts of Mexican baseball fans and outlast many grander and more historic structures in our city. I wonder what Mexico would do with all of the elaborately designed victorian and early modern structures we are currently demolishing. It says something about the value that Houston places in its heritage. Buffalo Stadium, circa 1948. Source: Wikimedia Commons. Before the Colt .45’s were the Colt .45’s they were the Buffaloes. The Houston Buffaloes (a.k.a “the Buff’s) were a minor league team first formed in 1887. Their Original home was Herald Park, then they moved to West End Park in 1905. Both of these parks are interesting examples of lost Houston History and I encourage you to follow the links and read about them, but right now I want to move on and talk about the team’s last ,and arguably most storied home, Buffalo Stadium. In 1921 the St. Louis Cardinals purchased a majority stake in the Buffs. The Buffaloes became a farm team of the Cardinals, which meant that young players would be sent to the Buffs to gain training and experience before hopefully becoming good enough to graduate to the Major League Cardinals. 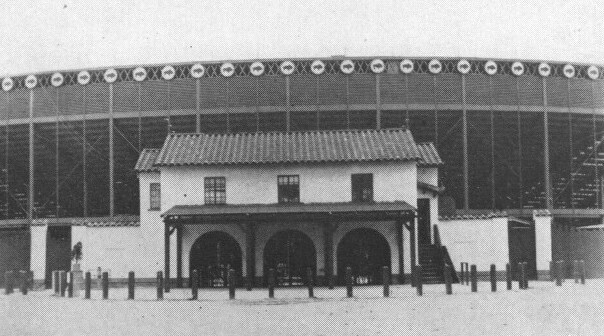 With the relationship between the teams sealed, the Cardinals financed an new and improved stadium which was built in Houston’s East End in 1928. At the first game in Buff Stadium Texas Governor Dan Moody threw the first pitch, with Houston Mayor Oscar F. Holcombe as his catcher and Houston Businessman Jessie H. Jones as umpire. All of these men have multiple streets and parks named after them now. The stadium went on to host the first ever night game between two major league teams when the Chicago White Sox and New York Giants were in town for an exhibition game in 1931. The stadium also witnessed the racial integration of baseball. Originally only white men could join the Buffaloes, African American players formed their own teams like the Black Buffaloes and The Black Eagles. Black teams rented the stadium and were only allowed to use it on weekends when the Buffs were away for a game. Even though they paid to use the stadium, they were not allowed to use the showers and other amenities available to the white team. Segregation at Buff stadium finally came to an end in 1954 when Bob Boyd and Willard Brown joined the Buffaloes. The Buffs were purchased by the Houston Sports Association in 1961 and soon became the Colt .45’s. Many players and members of team management were allowed to stay on as the team was brought up to the Major League. The team was moved to Colt Stadium in 1962. Buffalo Stadium (which, incidentally, had been re-named Busch Stadium in 1958 after Anheuser-Busch bought the Cardinals) went unused until Sammy Finger, owner of Finger’s Furniture, purchased the stadium in 1963, had it demolished and built his new warehouse and showroom on the spot. A commemorative plaque was placed on the spot in the showroom where Buff Stadium’s home base once stood. The Finger’s Warehouse, and the home base plaque, still reside at the corner of Leeland St. and Cullen Blvd, but the store has closed and the property has been sold to a developer, so who knows what will happen.